I recently interviewed Jamie Smith about his unique book, Thinking in Tongues: Pentecostal Contributions to Christian Philosophy (Eerdmans, 2010). The book is part of a new Eerdmans "Pentecostal Manifestos" series co-edited by Smith and Pentecostal scholar, Amos Young. Jamie Smith is Professor of Philosophy and Adjunct Professor of Congregational and Ministry Studies at Calvin College. He also serves as Executive Director of the Society of Christian Philosophers. He recently contributed to a Philosophia Christi discussion on William J. Abraham's Crossing the Threshold of Divine Revelation (purchase here). 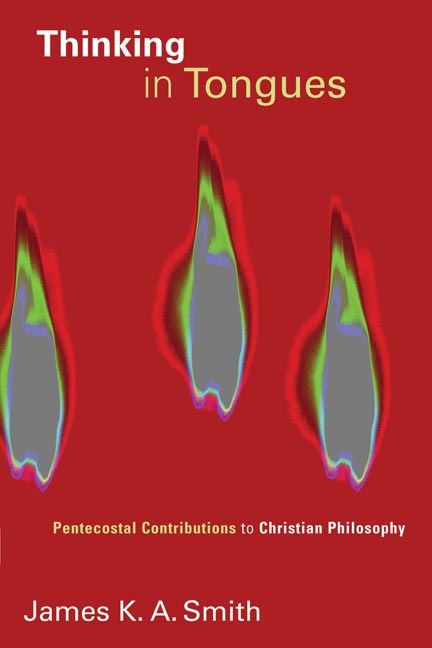 Thinking in Tongues not only seeks to articulate a "pentecostal worldview" (more on this below), but it also tries to envision how that worldview can contribute to philosophical discussions on epistemology, science and religion, ontology, philosophy of religion and philosophy of language. He recently spoke about some of these issues at the Society of Vineyard Scholars, where I had the opportunity to hear him present. Below is Part One of my multi-part interview with Jamie Smith. Your book is unique, engaging and very interesting at a variety of levels. To start off, can you introduce us to some of your motivating passions for this topic, especially as you help us appreciate how this writing project came about for you. JKAS: My spiritual pilgrimage has included a significant, formative time in Pentecostalism (the Assemblies of God in particular). And while I am now Reformed, I very much consider myself a Reformed charismatic. So as a Christian philosopher who is trying to work integrally from the riches of a Christian worldview, I felt I also needed to take serious what I “know” as a pentecostal—to let some of the unique “intuitions” of charismatic spirituality function as starting points for working through some philosophical issues about knowledge and reality. Because I believe Pentecostal and charismatic Christianity has a unique “apostolate” in the body of Christ, I thought that apostolate should also translate into an intellectual project. This is a motivating factor behind Thinking in Tongues, but it also informs the book series of which it is part, the “Pentecostal Manifestos” series. I would also say that I wanted to undertake a project like this because I felt it would honor the shape of global Christianity, which just is charismatic Christianity. I’m not sure our global brothers and sisters can always recognize their Christianity in the rather staid versions assumed by most philosophy of religion. So one of my hopes is that Christians in the majority world would find in here a philosophical articulation of the Christian faith as they live it on the ground. Speaking of “articulation of the Christian faith as they live it on the ground,” I am wondering if you could help us be acquainted with the sort of experiences – indeed, communal practices – that you, as a member of a Reformed charismatic community, engage in as a routine in your formation, especially as a philosopher. So, for example, one might just have the impression that the dominant or only practice of your liturgy is one of quite literally just speaking in tongues or helping to interpret tongues. Can you help color in the picture for us of how openness to the Spirit, for example, makes a difference in how you “do scholarship”? JKAS: Well, while I describe myself as a Reformed charismatic, it’s difficult to find a community of practice that is characterized by that sensibility. So where I am right now, I wish I had more communal practices to sustain this. Individually, however, I hope that “openness to the Spirit” is reflected in the role that prayer plays in my scholarship. One of the tasks for a Christian scholar is to discern a trajectory of research—to try to discern that questions that I should be asking and pursuing, at this moment, given my gifts and calling. I don’t think we should just be following intellectual fads, nor do I think Christian scholars should simply be pursuing the questions that currently fascinate the guild. I have learned that prayer and an openness to the Spirit’s leading are important for discerning that trajectory. Who can fathom the depths of your love? And yet, of course, we can and do praise God with our words, and our kenotic, incarnational God condescends to be praised in and by such finite words. Well, that set me on a path of thinking through the philosophical issues of language: how can finite words do justice to an infinite God? This led me back to Saint Augustine who prompted me to articulate an “incarnational” account of language in one of my earlier books, Speech and Theology: Language and the Logic of Incarnation. So, in an important sense, the practices of worship and the discipline of prayer have informed my research. How should we understand and appreciate Thinking in Tongues in light of the intent and scope of your other books? For example, there’s clearly some interrelated discussion with this book and Desiring the Kingdom. Feel free to elaborate here, but how else should we understand Thinking in Tongues in light of your other writings? Help us see how the bibliographical dots are connected. JKAS: This is a great question, Joe. In some ways this has only become clear to me recently. For example, I think you’re exactly right that, in an important way, Thinking in Tongues is already a kind of sequel to Desiring the Kingdom, even though there is already a proper volume 2 of my “Cultural Liturgies” project in the works. So, let me highlight just one connection: in Desiring the Kingdom, I argue that there is a kind of “understanding” that is carried in Christian practices (especially worship practices)—this is an “understanding” which is distinct from “knowledge” (I’m using a distinction from Heidegger here; forgive me!). And I argue that we absorb such an understanding on a register that is more affective than intellectual—it is more like a kind of know-how than know-what. Such an understanding is more on the order of the imagination than deductive inference. Because of that, I also suggest that such an understanding is most powerfully expressed in narratives rather than abstracted proposition—it is a kind of truth that is better painted than propositionalized. Which is why, in Desiring the Kingdom, I try to use some creative interludes from novels and film to sort of activate the imagination. Well, now I would say that in Thinking in Tongues, I try to work this out in how I write. In particular, I try to often paint pictures of a scene of charismatic worship, or recount testimonies and stories which are integral to pentecostal spirituality. So I guess, in a way, I hope that Thinking in Tongues sort of performs the claims I make in Desiring the Kingdom. I also think this new book works out some epistemological implications of this that were left more inchoate in Desiring the Kingdom. So I’ve sort of come to think of Thinking in Tongues as volume 1.5 of my "Cultural Liturgies" project (but don’t tell the publishers that :-). The distinction between “understanding” and “knowledge” is helpful here. So, would you say that affectivity is a way of knowing? Not knowing in the sense of propositional knowledge, but knowing, perhaps in two distinct, yet interrelated ways: affectivity as knowing by direct acquaintance and having know-how? If so, then can you help us see how your use of “affectivity” relates to recent philosophical work on the emotions or affections? JKAS: I connect this affective “understanding” to Bob Roberts’ model of the emotions as construals. So on that account, the emotions are already a kind of “take” on the world, a construal or interpretation that is intentional and responsive to the world as it is given to us. But I might also relate this to Merleau-Ponty’s notion of the body’s praktognosia—a unique and irreducible bodily “knowledge” that is also a responsive “take” on the world that we bump up against. As soon as my hand reaches out to grasp the cup in a particular shape without my thinking about it, we see that in a sense my hand “knows” the cup at some level. Now, I’m not trying to reduce “affective” knowledge to merely biological mechanisms, but I do think there’s an analogy there, so that we might construct an epistemology “from below,” so to speak. In discussions about Desiring the Kingdom and Thinking in Tongues, I’ve sometimes gotten the impression that, for you, “desire,” “affections” (or “affectivity” or “appetites”) “emotions” or “feelings” all represent the same reality. Is that the case for you? Are these really distinguishable? Or are these just different ways of talking about the same thing? The main reason I am asking is that I am wondering how these distinctions figure (if at all) in your account of what love and affectivity are? JKAS: I struggle with this a lot. Our epistemological lexicon is calibrated for intellectual, ratiocinative, conceptual knowing. As soon as you try to give an account of non-conceptual understanding, the language and categories of propositional knowledge become clunky and ham-fisted. So I often find myself struggling to find a lexicon to describe these intuitions. The result is that I draw on a range of terms like you’ve noted, but those also have different connotations in different contexts. It is true that, as far as it goes, I tend to treat “desire” and “affections” as roughly synonymous; but I try to not equate those simply with “feelings” or “emotions.” So I’d want to introduce some nuance there. But this is very much an active avenue of research for me. I’m now working on the sequel to Desiring the Kingdom, volume 2 in my "Cultural Liturgies" trilogy and I’m hoping to achieve some clarity on this matter there. Your Thinking in Tongues immediately struck a chord with me as I began to initially peruse it here's why: the value of paying attention to Christian spirituality and spiritual practices for the health of Christian philosophy. I found this heartening because I enjoy and would like to see more work that integrates philosophical reflection and spirituality. It seems to me that you are saying that philosophy is a "handmaiden" to spirituality. Is that accurate? If so, can you elaborate? JKAS: Obviously the project of “Christian philosophy” has exploded over the past generation, and I am completely indebted to that renaissance. But you’re right: I’m trying to push the conversation a bit further in this way: to date, I think a lot of Christian philosophy has been kick-started by the sort of philosophical jolt that comes from Christian beliefs, doctrines, and ideas. This is how Alvin Plantinga’s Reformed epistemology worked, letting the philosophical pump be primed by the teachings of Scripture as elucidated by Calvin, Aquinas, Augustine, etc. I think Etienne Gilson pictured the Christian philosophy of Aquinas as the same sort of project. And I’ve done that kind of work, too: my earlier book, Speech and Theology, took the doctrine of the Incarnation as a catalyst for thinking through key questions in philosophy of language and communication. But now in Thinking in Tongues, building on the project sketched in Desiring the Kingdom, I’m arguing that Christian philosophers should not just look to the resources of Christian concepts; we should recognize that there are philosophical “intuitions” (for lack of a better term) implicit in Christian practices, in Christian spirituality. As implicit, these are not necessarily articulated (indeed, in some sense they might be inarticulable). But by “exegeting” the understanding that is implicit in Christian spirituality, we can make explicit (per Robert Brandom) the wisdom embedded in our practices and then sort of “run” that wisdom philosophically to tease out its unique implications. In some ways, I think for anyone who has read Dallas Willard, this should immediately make some sense—even if I tend to focus on communal worship practices whereas Prof. Willard tends to focus more on personal spiritual disciplines. But I would hope that a reader of Thinking in Tongues would sense overlapping concerns between us. I am both personally acquainted and supportive of what you mean by "pentecostal" in this book. But for the sake of our interview here, help us understand what you not only mean by "pentecostal," but even more, what you mean by "pentecostal philosophy." JKAS: Oh, yes: following the work of others such as Douglas Jacobsen and Amos Yong, I adopt the nomenclature of “small-p” pentecostalism as a shorthand to be able to talk about those aspects of a spirituality that is held in common by “denominational” (capital-P) Pentecostals, mainline charismatics, and nondenominational charismatic folks (including Vineyard). While there are clearly important differences between these groups, I’m concerned to identify what they share in common and describe that shared set of practices and intuitions as a “pentecostal” worldview. Why do we need a "pentecostal philosophy"? Help us understand how you understand the need in light of the vision that you propose. JKAS: Well, “need” might be a bit strong. I think having any philosophy is always a bit of a luxury: you only have the time to have a philosophy if you’re bourgeois enough to have the leisure to sit around and think. And thank God for such leisure! But I guess I’m immediately attentive to my brothers and sisters in the majority world who don’t have the luxury of being able to afford the sort of education that makes this project possible. So I just want to flag the sense of “necessity” here. That said, I think we need to develop a uniquely pentecostal philosophy precisely in order to tease out the unique implications of a pentecostal worldview for the wider church. That is, I think pentecostal spirituality has something to offer not just to piety, but to intellectual reflection as well. Pentecostals and charismatics have very successfully “exported” forms of worship and spiritual practice to the wider church. I’m suggesting we have similar intellectual riches to share—it’s just that those intellectual treasures are buried in our practices and not yet articulated in our theory. So this is a start at trying to unearth those latent philosophical gems. In what specific ways is your proposal for pentecostal philosophy similar and different from Plantinga's "Advice to Christian Philosophers." JKAS: As you know, Plantinga’s “Advice” was a watershed moment for me vocationally. And I very much see this project as just an extension and specification of Plantinga’s call for boldness on the part of Christian philosophers. For example, for Al, the task of working out a distinctly Christian philosophy was not just generically Christian: in his case, this was further specified in the shape of his Reformed epistemology. Well, in a similar way, I’m arguing that a pentecostal philosophy is a further specified form of Christian philosophy. Your account of "worldview" is important to your project, and indeed, important to understanding the very metaphor that occupies your book's title: Thinking in Tongues. Let's talk about that further. What are the main features of your account of what a worldview is? Help us also understand what you mean by “thinking” in this context. I suspect that you mean something more than just mere thoughts. Now, in Thinking in Tongues, for the sake of my argument, I sort of treat “worldview” and “social imaginary” as synonymous. So what I call a “pentecostal worldview” is probably better described as a pentecostal social imaginary, since my point is that this is a kind of inchoate, implicit understanding that we “know” in practice but often don’t articulate. One of the tasks of a pentecostal philosophy, then, is to do that work of articulation—to make explicit what is implicit. What do you see are the main elements of a pentecostal worldview? an eschatological orientation to mission and justice. The book unpacks all of these in more detail, obviously, and then goes on to tease out some philosophical implications for a pentecostal ontology, epistemology, philosophy of language, and philosophy of religion. This is obviously only scratching the surface. So, when you say “thinking in tongues” (my emphasis), by “in” do you mean that our worldview, general (or maybe just pentecostal as a worldview, specifically), mediates our view of reality? Asked more directly, do we have direct, epistemic access to what is real? If not, why not? Is our knowing always mediated in some way (perhaps by language? our cultural formation?). What difference would it make for you if we think with (instead of "in") a worldview? JKAS: I wouldn’t want you to over-read the title. The title is what it is: a playful, provocative metaphor. In fact, as you’ll notice from my outline of a pentecostal worldview above, I don’t even make tongues-speech central to a pentecostal worldview. So I’m not suggesting that thinking in tongues is like that horrible B-grade movie from my youth, Firefox, where pilots had to learn to think in Russian in order to fly the plane ;-). But to your question: um, this isn’t going to make me any new friends in EPS, is it! :-) But I think you’re rightly discerning my point. Maybe I could put it this way: “worldview” talk has always been associated with perspectivalism. Or at least, I would say that “worldview” as I’ve inherited from the Reformed tradition of Kuyper has always been a perspectivalism: the point is precisely that everyone is working with some worldview which provides an angle, a “take” on reality. That doesn’t mean we’re not bumping up against a reality which is beyond ourselves, a “givenness” that pushes back on us. It just means that such a reality is only constituted as something on the basis of horizons of expectation, on the basis of an epistemic framework that is contingent. And that framework or grid we call a “worldview.” This is the basic argument of my very first book, The Fall of Interpretation: Philosophical Foundations for a Creational Hermeneutic (which will soon be re-released in a second edition, by the way). So, in this case, I’m suggesting that the worldview that is implicit in pentecostal spirituality constitutes the world differently for those who are shaped by that practice. And that’s a good thing; indeed, I think it is the best interpretation of this world that is sustained by the Son through the power of the Spirit. You can learn more about Jamie Smith at his website and follow some of his ongoing interests at his blog, "Fors Clavigera." Love that guy. Thanks for posting. Interview with Mike Austin: "Ethics for Everyone"